From time to time I am asked where my fashion plates are from, geographically, or what the differences were between the fashions in different countries. My replies usually include links to the above two pictures. 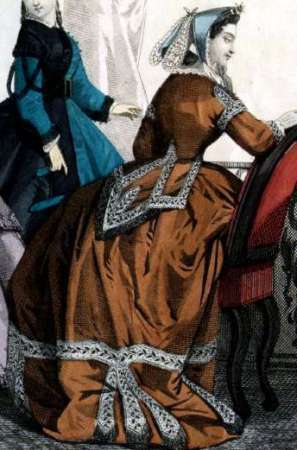 It is not without reason that in the picture database, I have dropped any reference to geography in the case of 19th/20th century fashion plates. The left of the above pictures is from an American magazine - Peterson's, I think, but it could be Godey's - and dated 1865. The right one was in the possession of my grandmother and is undated. When I took it out of the frame to scan it, there was a French magazine name hidden under the frame, but I didn't write down what it was before putting it back. Since fashion plates didn't travel quite as easily in grandma's time as they do now, what with eBay and such, I think it's safe to say that the plate is of European origin. I guess I don't have to point out that except for the colour, those two dresses are exactly the same. 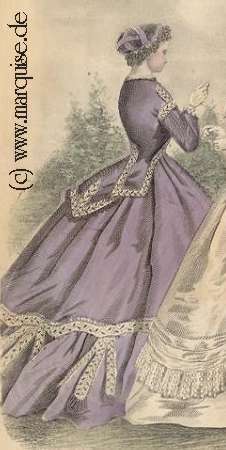 So obviously, the same style of dress appeared on both sides of the pond. That's not too surprising if you think about it: Paris was the centre of fashion, Paris was where new styles were invented, engraved, printed, and the prints exported throughout the Western world. British, German and American magazines sported columns on the latest fads by a reporter who sat in - guess - Paris. At the bottom of the prints in my 1848 edition of (American) Graham's Magazine, there's a French caption "Le Follet/Boulevard St. Martin 61/Coiffures de Croisat, rue Richelieu 74..." and so on. At the bottom of prints in Peterson's Magazine, it says "Les Modes Parisiennes", and on prints in a Belgian magazine, "Modes Françaises". All those engravings were obviously printed in France, then bought by the editors of fashion magazines everywhere and included in their publications. While there still were obvious, albeit relatively small, geograpical differences in the 18th century (when there were only very few fashion magazines about), the 19th century saw the globalisation of fashion. Fashion magazines were one of the reasons for this development by informing customers throughout the western world about what was the rage in Paris. Steam ships, the railway and public mail service enabled magazine editors to stay in closer touch with the fashion capital, and the readers to receive their copies fresh from the press. The countries are, from left: Germany, England/USA, Italy, Scandinavia, Portugal, Russia, Hungary. If you want to find older Pictures of the Month, use one of the above links to jump to a previous edition, and from there to yet older ones etc.